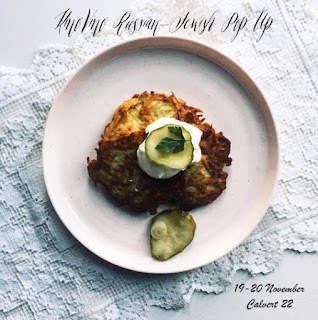 KinoVino, the imaginative pop-up that usually pairs food with films, is stepping out of its comfort zone on the weekend of 19th and 20th November 2016, with two lunchtime / afternoon Russian sessions at Calvert 22 in Shoreditch, with food from founder Alissa Timoshkina. No booking - just turn up, and expect to enjoy dishes like Latkes (potato pancakes) with toppings like – Smoked salmon and dill crème fraîche. Yum! "Calvert22 in Shoreditch will be hosting a weekend of classic Jewish cuisine by KinoVino's supper-club founder Alissa Timoshkina, who will be cooking at her first ever pop up at Calvert's cafe on Saturday 19 and Sunday 20 November, 12pm – 6pm. Delving into her Russian-Jewish culinary heritage, Alissa will serve an array of gastronomic classics like latkes, farshmak and blintzes, which you can enjoy with a signature drink, "Medok". "Medok" (apple, honey and thyme soft drink)"